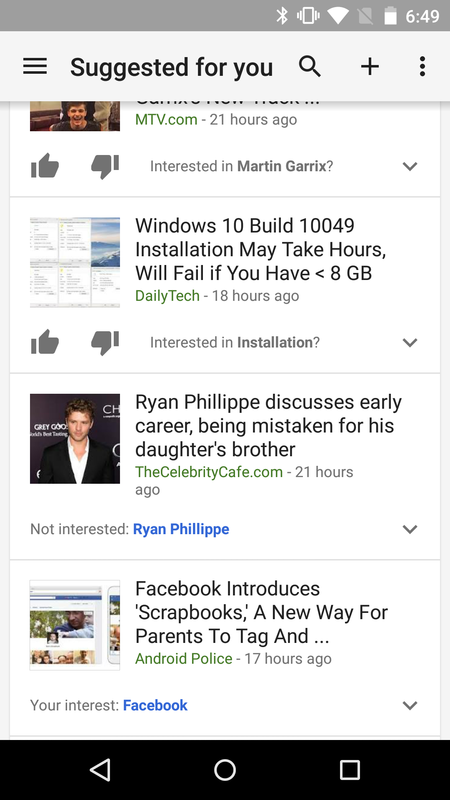 The News & Weather app is a bit of a dark horse among Google's lineup. 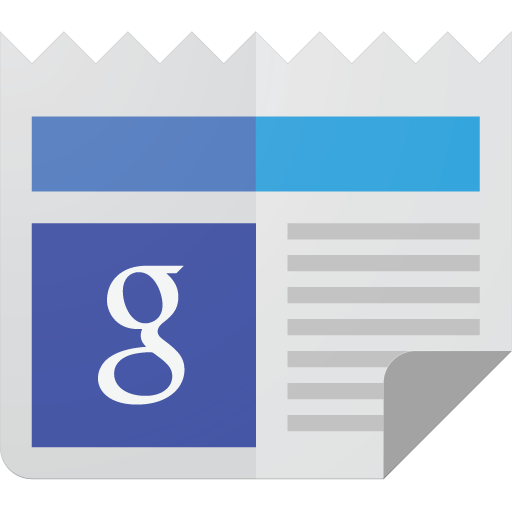 It's also not as talked about as Google+, or as vital as Gmail; and it doesn't fit in with the Play-branded apps like Newsstand, which it is effectively a direct competitor to. 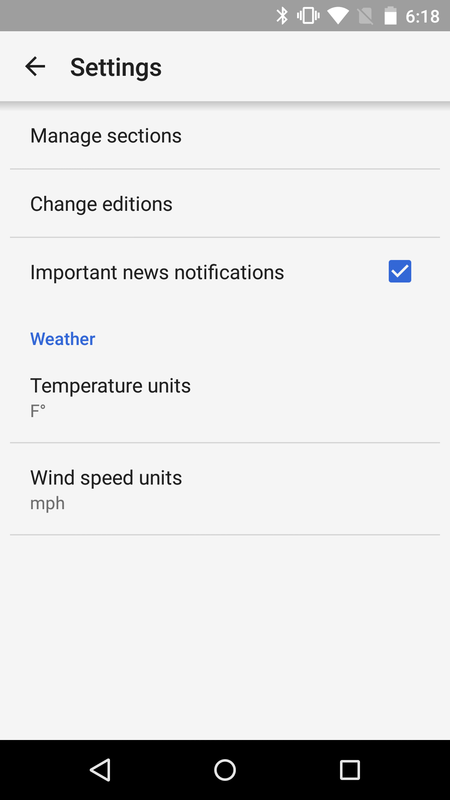 For many people, News & Weather is just another widget that came pre-installed on a Nexus device, at least until it was made available on the Play Store, in late August. Since then, a few really big updates have drastically improved the once stale app. 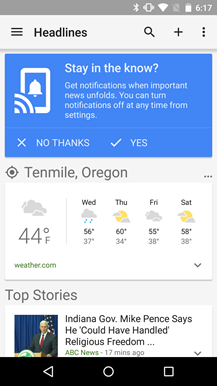 This trend continues as a bump to v2.3 adds notifications for important stories, an easier interface to configure the weather card, and a 'Suggested For You' section that allows users to fine-tune their topics of interest. Without a doubt, the headlining feature of this update is Important Notifications. Google even gave it a card at the top of the stream to let users know it exists, including a prompt so it could be enabled right away. 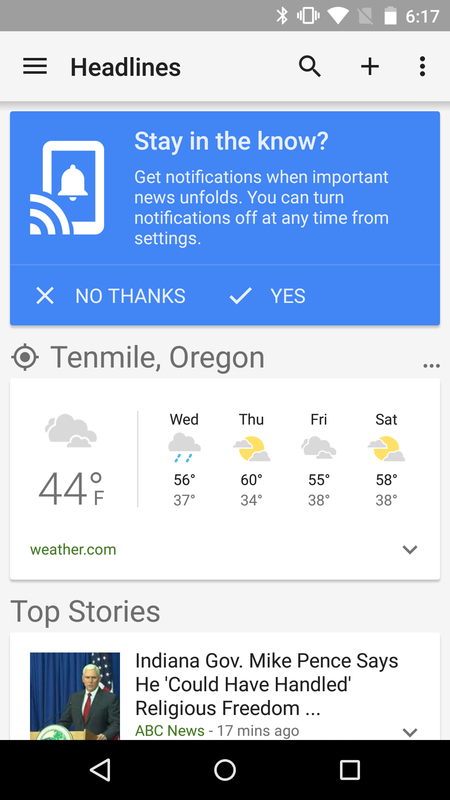 The new feature allows News & Weather to post system notifications when major news breaks. There's not much more to it than that. It's not clear what kind of news will warrant special attention or if things like reading habits will play into the decision. If notifications become too obnoxious, they can be switched off in the Settings screen. 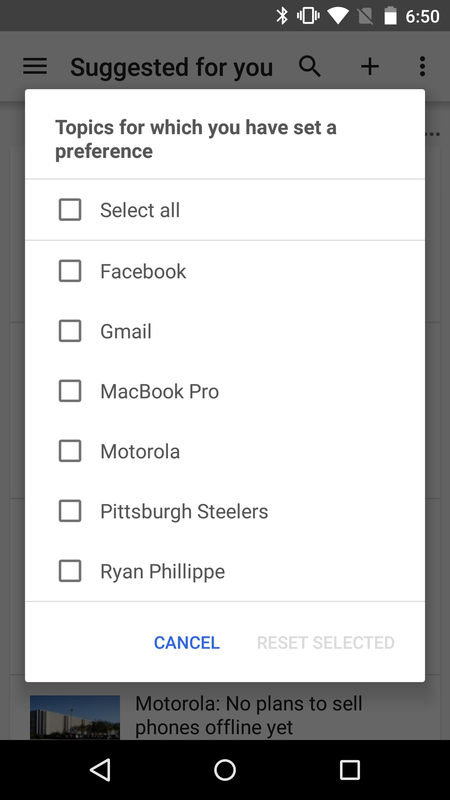 Speaking of a Settings screen, that's new, too. 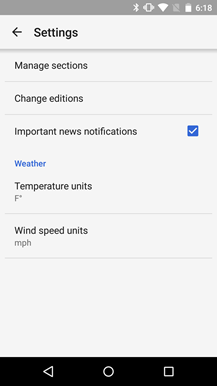 In previous versions of News & Weather, there was no single dedicated Settings screen. 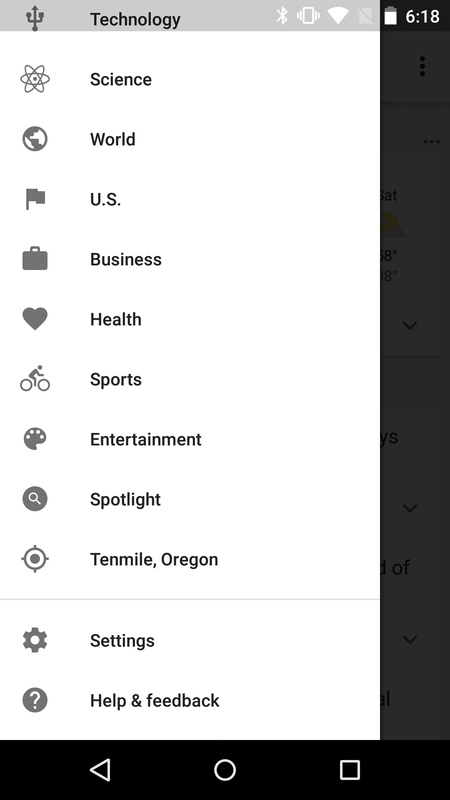 Instead, the individual options were scattered around in the app's overflow menu, the mini-menu on the Weather card, and at the bottom of the navigation drawer. After the update, most of the access points are still available in the same spots, but now they are also collectively available in a single Settings screen. Just slide open the drawer and scroll to the bottom to find it. Finally, News & Weather has a new category called 'Suggested For You,' including personalized recommendations for each user. 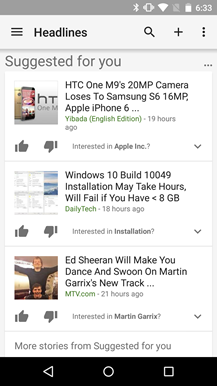 The recommendations appear to be based on each user's search history, but may also take into account reading habits, card settings from Google Now, and whatever other information Google might have laying around. 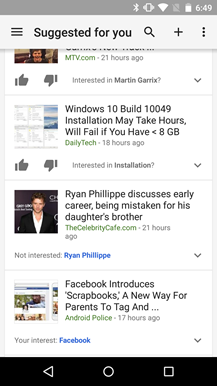 In the (likely) event that a topic is suggested that isn't actually of interest, there are buttons below each suggested news post that can be used to moderate the feed in the future. If a user fat-fingers the wrong choice or has a change of heart, there is an option to 'Manage interests' where these selections can be reset. 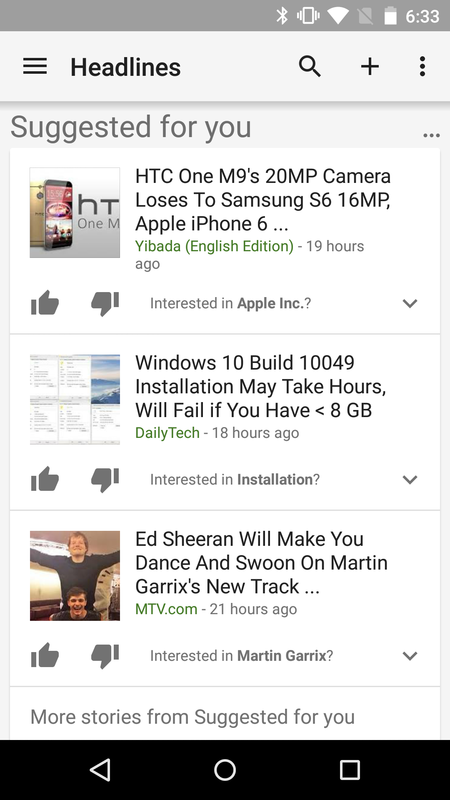 The dialog is available from the mini-menu at the top of the list of recommended articles (not the app's standard overflow menu). Strangely, this screen only shows which topics received feedback, but doesn't give any clue about the actual preference. Is this a privacy concern or was it just forgotten? A slightly newer build just popped up, and it appears to be a minor bug fix. The download link has been updated to point to build 1824253 instead of 1821444.